Perth holds no fear for Melbourne, so it goes. But there’s many more reasons for the Dees to feel confident heading into this afternoon’s preliminary final against the West Coast Eagles. Will those reasons be enough to overcome a more rested opponents on their home deck? We’ll find out in a few hours time. If momentum exists, and the evidence is scant that it does, then Melbourne holds the world’s most plentiful supply of it. The Dees have won eight of their last ten games, with a percentage of 147 per cent (which translates to an average margin of 33 points). In that time Melbourne has beaten Geelong, Greater Western Sydney, Hawthorn and West Coast. The Dees have a decent track record in Perth in recent times too. Their last trip to Subiaco was a memorable victory, in one of the better games of the 2017 season. It was also the club’s first win out west against the Eagles since 2002, Tom McDonald’s decisive last kick of the game ending a nine game ground-opponent losing streak. That carried to the club’s last outing in Perth, a 17-point win over the Eagles at Perth Stadium (a game I covered for The Roar). As I said, if momentum is a thing, then Melbourne would appear to have it. But there are genuine Xs and Os reasons to be all in on this game, beyond it being the second last game of the AFL season. And it begins at the selection table. West Coast has recalled single club journeyman Will Schofield as replacement for the injured Brad Sheppard, Schofield able to play the flex-defender spot with his strong marking and on-the-ground pace. It does make the Eagles’ defensive set look a little on the tall side, though Melbourne’s mid-sized forwards would have given them trouble anyway. That one was predictable. Melbourne has made a more significant change, dropping half back Bayley Fritsch for the taller and stouter Joel Smith. 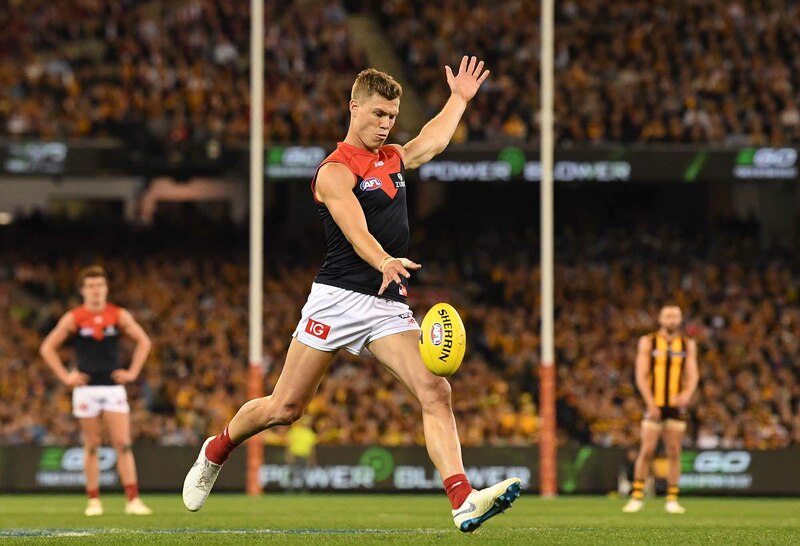 Fritsch has played 23 games this season, and has been one of the reasons the Dees have been able to become such a powerful scoring side on turnovers. He’s part of a relatively small defensive set, which has generally rolled with two tall defenders, three mid-sized and one small in Neville Jetta this season. Smith has played seven games this year, coming in as a third tall in two separate blocks in 2018. The prevailing view seems to be Melbourne has picked Smith to assist the Dees account for the three tall forward set up of the Eagles: Josh Kennedy, Jack Darling and a resting ruckman (mostly Nathan Vardy, and sometimes Scott Lycett). Through that lens that makes sense, but one can’t help but think Melbourne is reacting to something that shouldn’t even be an issue. The Dees have conceded just 47 inside 50s per game – the second fewest in the competition – and they are worried about what the third (at best and probably fifth in reality) most threatening forward 50 target might do to them. And to ameliorate that they were willing to toss out a critical element of their winning formula. I don’t like it. It isn’t going to be the difference between a win and a loss, but every little bit helps – or hinders. What makes it even more puzzling is the Dees beat West Coast a month ago on the back of its system. With a fast start in the books, Melbourne settled in to its work by beating up the Eagles around the ball and cutting off their kicking lanes in defence. But it wasn’t defence that won Melbourne the day. The Eagles had about 50 minutes of possession, which on their season rate would suggest they’d score 89 points. They scored 91. Instead, it was Melbourne’s incisive attack, which scored 2.04 points per minute of possession against West Coast’s season long rate of 1.50 points per minute of opposition possession, which was the difference. And that is what Melbourne will need to do again. West Coast’s defence has been sound all season, conceding 100 points just twice on the year. The first was Lance Franklin’s eight goal haul in Round One, and the second was against the Dees in Round 22. 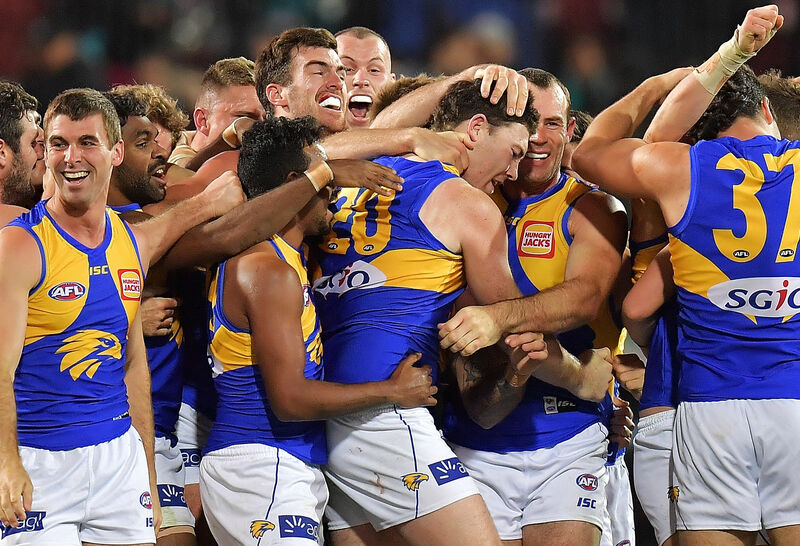 Jeremy McGovern, Shannon Hurn and the rest of the crew have also been crucial to setting up West Coast’s outside kicking game, their decision making with ball in hand helping the Eagles navigate – or bust – opposition defensive zones. Melbourne shut this down in Round 22, with disciplined formations and a commitment to moving with the play as the Eagles attempted to switch. Now, it is important to note West Coast was missing two of its most important ball movement cogs in Darling (knocked out ten minutes into the game) and Kennedy. It meant the Eagles struggled to find a bail out option down the line, and it allowed ruckman Max Gawn to intercept and rebound at will. This time, they are both in place, and while Kennedy looked awful in the first half he came into his own in the second. Melbourne will feel confident that it can win the inside battle once again. The Dees were +14 in clearances and +25 in adjusted contested possessions on the game. The clearance number is outsize, even for Melbourne wins (+5) and West Coast losses (-6). The adjusted contested possession number is, however, about right: in wins Melbourne has averaged +23 on this metric, and in its losses West Coast has averaged -21. The critical issue in the last game then would appear to have been ball movement. Can Melbourne bring the commitment and pressure that allowed them to disrupt West Coast’s ball movement, and counter quickly the other way? Their last three months suggests it is certainly possible. But the Eagles will have learned from last time out, and this time have a forward line more like the one that has gone scorched earth more often than not in 2018. It shapes as a stellar final, with an interstate bottom half of the eight finisher given more than a puncher’s chance of victory. The market has West Coast about a half a goal favourite, though we’ll see if that carries to game day when the big boys get involved in the exchange. Personally, I think home field advantage, the extra week off, and the very clear adjustments bought by the return of Kennedy and Darling to the West Coast side are enough to suggest there won’t be a repeat of last time out. Melbourne is a great football team that has the makings of a phenomenal one, but its 2018 run will end here. West Coast will win, by six points, and the game margin won’t extend too far beyond that for most of the day. That’s my preliminary final forecast, what’s yours?